I was in such an awesome mood when I put these nails together. A few months ago I picked up some of the layering plates from MoYou London. They have a variety of lines, dots, flowers and leaves that can be mixed and matched in a number of ways. They make me so happy!! So many possibilities! The first day I got them I pulled them and some of my favourite stamping polishes out and put these nails together, and I've been in love with them ever since. 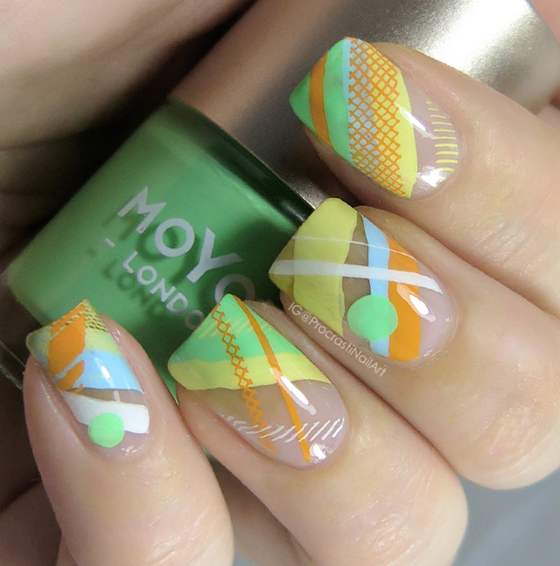 (Both this nail design and the plates in general!) I definitely have to pull them out to play more often! So what plates exactly am I talking about, you're wondering? 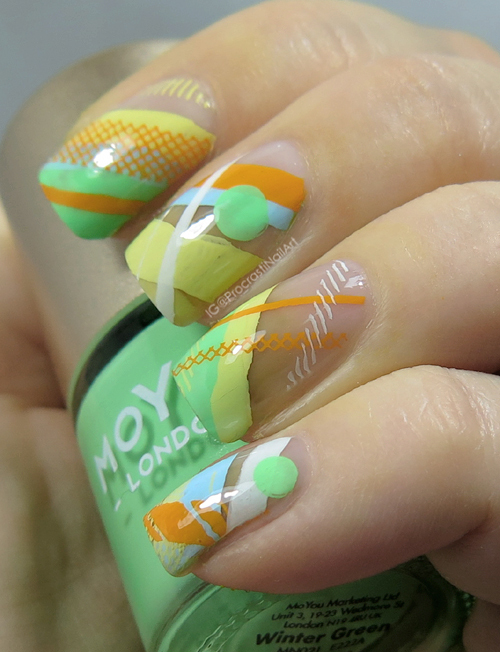 They would be MoYou London Tropical Collection 23 and MoYou London Holy Shapes Collection 19. Before I started I laid down a single coat of Deborah Lippmann All About That Base (review here) to even out the colour tone of my natural nails a bit and to give the polish something to grab on to. Also, please excuse how yellow my fingers are! I used up the last of my yellow liquid latex around my cuticles when I did this mani and I think it stained a little bit. :( I didn't notice until I opened the pictures up to post. Ah well. So yellow fingers aside I have to say I'm in love with how this turned out. :) The colour combo is really adventurous for me, and even thought not all of the lines stamped straight I still really quite like it. The variations in the lines is awesome, and the images picked up so well! Now that I'm writing this post I'm kind of feeling I need to do a full review of these plates to share the full level of awesome with you. Is that something you might be interested in? :) If so let me know below! The design looks nice with the negative space. This is such a fun pattern! I love how much fun this mani is! I would love a full review of the plates! 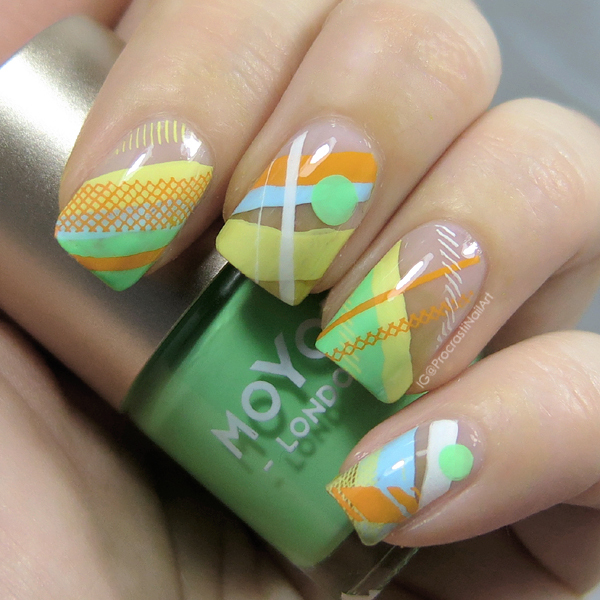 That's a really fun mani! I love the colors you used together! This is so amazing! I've never seen them used this way and it is awesome! Very Deco.